Here in the Kudzu-covered Southern reaches, we are heading into the time of year where refreshing marvelous drinks are de riguer for the middle of the day. 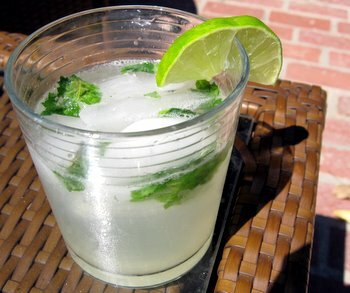 But while a good mint julip or summer shandy is always in order, and a wonderful Cuban mojito is a must to have at this time of year, there are many who cannot or simply don't want to have an alcoholic drink in the heat of the summer -- for whatever reason. Santa Monica's Border Grill has come up with a good virgin mojito that is crisp and refreshing without the alcoholic kick that many associate with the Florida staple. Combine the lime juice, sugar, and mint in a blender. Puree until smooth. Fill two tall glasses halfway with ice cubes. Pour half of the lime juice concentrate in each. Top with sparkling water, garnish with lime and mint, and serve. The recipe was featured in this week's edition of Good Food, aired on KCRW Santa Monica and podcast on KCRW.com.